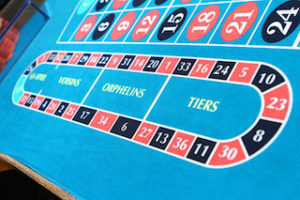 Roulette is simple enough that new players can pick up the basics roulette rules in just a few minutes hence learning how to play roulette online does not cause much trouble. At the same time, the betting and strategy is complex and involved enough to keep experienced players interested over the long term. This combination ensures that year after year, roulette remains one of the most popular casino games at both brick and mortar and online casinos. This practical guide shows you how to practice roulette online for players who are new to the game. I will take you through easy ‘step by step’ guide to how to play roulette, explain the difference between the two main roulette wheels, give you examples of few different bets available and wrap up with bankroll management. At a high level, the game play is very simple! Each player has a different colored stack of chips and places them accordingly on the table. When the ball lands in one of the colored slots a marker is placed on the betting grid. The winning amount depends on which type of bet was chosen. All you need to know as a player is what kind of bets you can make, and what the probability and payout for each one is. This order of events happens in either roulette game regardless if you play it in an online casino or in a casino on a live roulette table. It all makes sense as you continue to roulette practice. Now, let me explain the different types of roulette wheels before I explain various types of bets you can place on the roulette table. 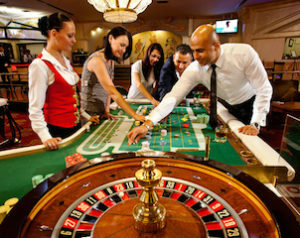 There are two distinct wheels used for roulette either it be played in a casino or in an online live roulette table. The US wheel has 38 slots, 36 are numbers and colored red or black. The remaining slots are zero and double-zero, and are green. The European wheel only has 37 slots, with just a single green zero. The main difference this makes is to the ‘even money’ bets like black / red or odd / even. If the ball lands on a green slot, all even money bets will lose. In the US wheel, there is twice the chance of this happening with the extra zero. Important: The ‘house edge’ (the average profit the casino makes from each spin over time or what you lose), is much bigger with the American wheel. You will see the European wheel recommended over and over on this site. The reason why is nothing to do with geography, and everything to do with keeping the casino’s advantage as small as possible. There are a lot of different bets you can make in roulette, here is a selection of the main types. You will find a more detailed explanation on our Types of Roulette Bets page. Even Money Bets – These are black or red, odd or even, and 1-18 or 19-36. You’ll get 1-to-1 on your money if you choose the right option. 1/3rd Bets – You can bet on 3 groups of 12 numbers, 1-12, 13-24 or 25-36. You can also bet on the 3 long columns of numbers which run lengthways on the roulette betting grid. These bets pay out at 2-to-1. Number Bets – You can choose any of the 36 numbers, and even the zero or double zero by placing one or more chips on it. These bets pay out at 35-to-1. Split Bets – If you place a chip on a line between two numbers then you are betting half of the chip on each one. You can also bet on 4 numbers by placing the chip on the cross between them. There is nothing to stop you betting on several of your favorite numbers at once, and many players do just that. Advanced players will place bets on a second betting surface, which is an oval, showing the numbers in the order they appear on the wheel. There are three sections within this oval, called Series A, Series B and Orphans (sometimes with French spelling). These are combinations of numbers from different parts of the wheel. You can also place a chip on the racetrack oval itself and request a bet on a number and its neighbors. This is your number and the two slots on either side. Remember: Racetrack bets are considered advanced and are for more experienced players as they add an interesting twist to the roulette game. Place this bet using caution! As you continue to practice how to play roulette and your knowledge and experience increases you will stop relying on roulette guide and start playing for real money in online roulette casinos. You’ll be able to add chips to the side of the betting grid, denoting rows and other combinations. A combination of even money bets, 1/3rd bets and numbers like a pro. In a very short time, you will master all the roulette rules how to play roulette and win. At the same time, a run of balls missing your numbers can often eat through your bankroll very quickly. I recommend that you divide your available cash into at least 30 separate spins to ensure you get to play a reasonable session and get more practice how to play the roulette wheel. You can always increase the amount if you hit a good run. Therefore, proper bankroll management is a key for playing live roulette online as well as in a casino.